... I'm slow in answering the last Challenge. This time, I'm not in Fiji (alas), but I'm flying all around the east coast of the US. I left the Googleplex last Thursday, and will be in motion for 15 days, giving talks here and there, attending various Information School board meetings, and teaching classes on how to be a better searcher. You'll be happy to know that most of the material in my "better searcher" classes is almost completely drawn from SearchResearch. So your comments and thoughts over time have worked their way deep inside the structure of my classes. I'm heading to Pensacola (Florida) to give a talk about "Artificial Intelligence, Machine Learning, or Machine Intelligence? Does it matter to the user?" It probably won't surprise you to learn that I don't think it matters, but the user has to understand what the system is doing, and that means giving some kind of explanation or story about what's going on. In a sense, this is what SearchResearch is all about: How can we learn how to use all of the online research tools available to us? There are many; what are they and how do they work? We don't need to know the fine detail about how the Google algorithm works, but we have to have a mental model for what it will do when we make particular kinds of queries. That's a key skill. If you don't know, you'll be surprised when a totally random query like [beelzebub dandelion tensor] gives you over 5K results. 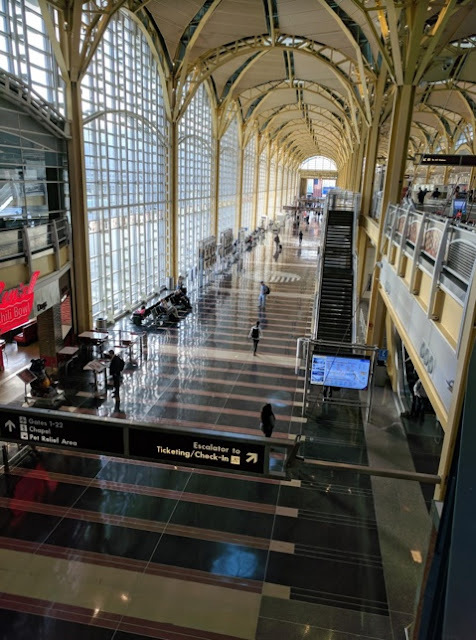 In any case, I'm actually writing the answer, but all of this time in airports takes a chunk out of my time--as does preparing for the talks, classes, and meetings. I'll get back to you, though, probably later this week. This is a particularly interesting Challenge, so I want to get it right! Thanks to everyone who's commented. I appreciate all of your thoughts and SearchResearch! I posted a few fishy pictures with the cryptic question "Have any ideas where these are, or where I am?" The SearchResearchers rose to the Challenge and were able to identify my location pretty well! While Remmij and Ramón both identified the fish and the geography those fish cover. 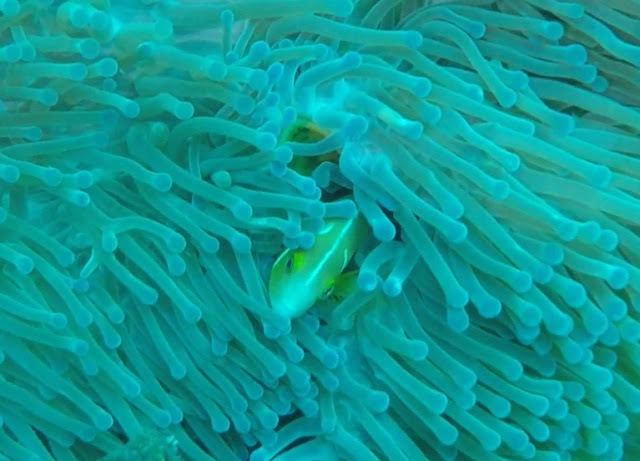 They also figured it out as Fiji, but Remmij went on to check species co-occurence by trying to figure out what kind of anemone that particular anemone-fish was living with. That's a great strategy, and if I'd thought about it, I would have included a better picture of the anemone (which would have helped identify it). 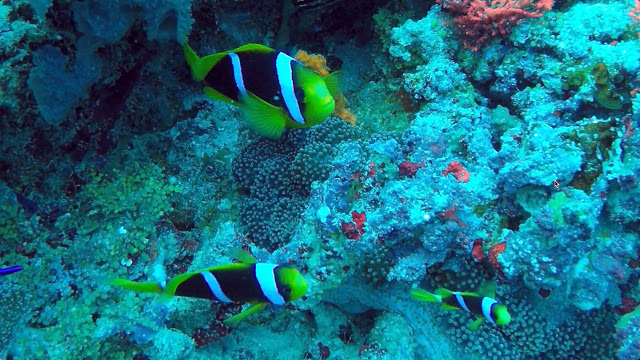 Alas, this particular anemonefish, Clark's Anemonefish (Amphiprion clarkii) happens to be pretty undiscriminating: "Clark's anemonefish is the least host specific anemonefish, living in association with all ten species of sea anemones that host anemonefish..."
The SearchResearchers are superb. Excellent job. Truthfully, I'd forgotten that I'd left all of the filenames on the images, so that when you saved them, you'd see all of the identifying information. 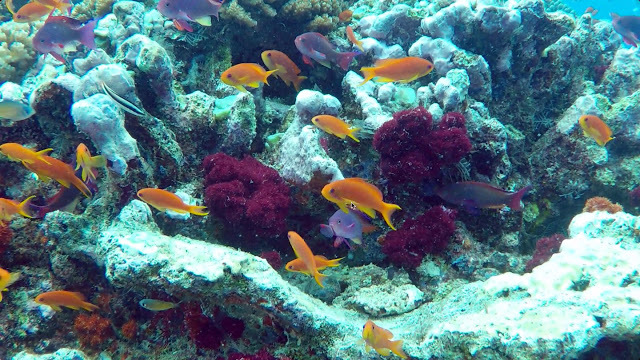 You correctly identified the Anthius in pic #1, and the Clark's anemonefish in #2. The anemonefish in #3 is a "Fiji anemonefish" (Amphiprion barberi), although in this case the color is a bit off, so it's difficult to tell. The "fusiliers on parade" are, in fact, Blue and Yellow Fusiliers (Caesio teres). And, when you look at all of these different fish geographical range, it's pretty much narrowed down to Fiji. Remmij is correct--we were on the island of Taveuni, which is a very well-known dive location, home to the Somosomo Strait, and one of the world's best locations to see soft corals, which I didn't include in this set of images--I thought it would be too much of a give-away! 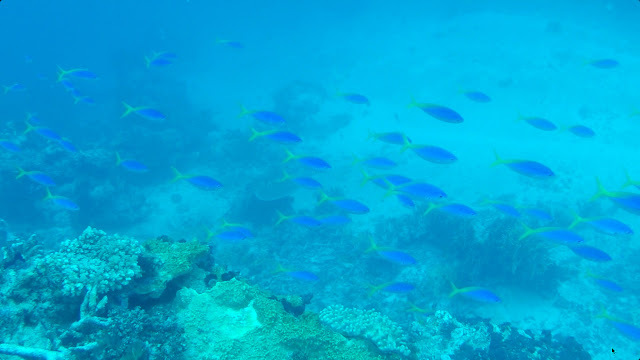 But here's a bit of video from our dives that gives a great sense of what it was like. Listen carefully--you'll hear humpback whales singing in the background! 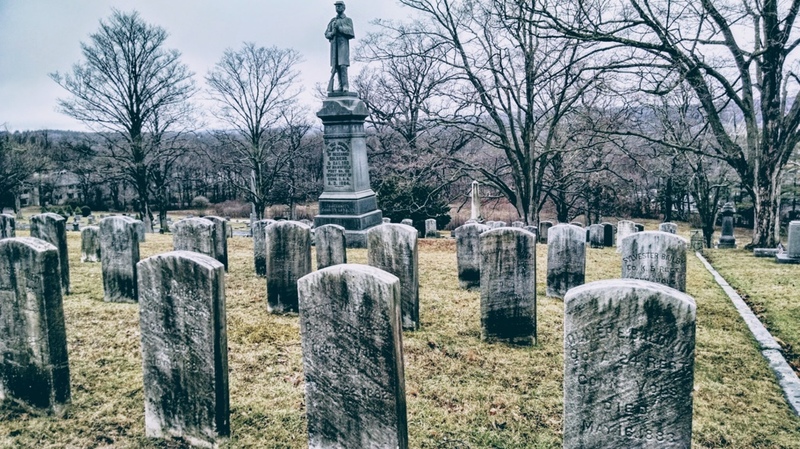 SearchResearch Challenge (10/11/17): How many people die each year in the US? ..but it's nearly both Halloween and the Día de los muertos. They're coming up fast during this time of the year. Naturally, that makes me think about those souls that have passed on before us, and being a naturally inquisitive person, I wonder about how it is that people die... in general. Do you know off-hand? I don't. Before you answer that question, give it a thought: What's your intuition about this? In the US, what fraction of people die from car accidents? It is as much as 10% of all deaths in a year? 15%? Or is it as low as 2%? 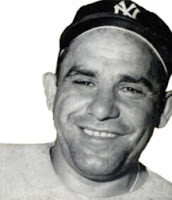 How many people die from other kinds of accidents, like falls from a high ladder or slipping on a banana peel? Is that a significant fraction, or is it less than 1%? What of different medical conditions? What fraction of people die from heart attacks vs. cancer vs. infections? Which is a higher proportion of all deaths--medical causes or accidental causes? I realize I don't know the answers to these questions, even though it's an important piece of data to know. 1. How many people die (from all causes) each year in the United States? The real SearchResearch question here is going to be a somewhat tricky data source problem: Where do you get your data from, and why do you believe it's accurate? That's a difference of 200,000 between Alpha and Google, which is slightly more than the population of Akron, Ohio! How's that possible? What's going on? Let us know what you find out... and just as important, HOW you figured out the answer. What sources do you seek out? Do you trust them? How much do you know about the methods they used to collect the data? 4. There's a story about the lake below that predates its existence. 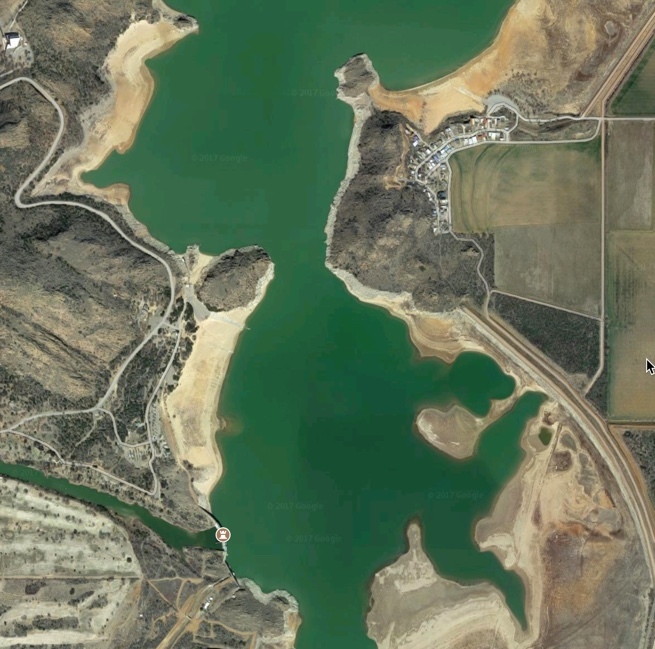 Before the lake was formed by building a dam, what was here? And why would they build a lake on top of it? tells us that under the water lies the former town of Lugert. Founded in 1902, Lugert (named for German immigrant Frank Lugert) was destroyed by a tornado on April 27, 1912. When the reservoir runs dry, you can can see the old foundations of the houses which used to stand in the area. In 1926, the nearby city of Altus passed a bond measure to build a dam across the North Fork of the Red River as a source of city water, flooding the town of Lugert. The dam was completed in 1947. Not one to quit, Frank Lugert rebuilt his buildings and moved his General Store next to the lake and ran it until a few years before his death in 1958. This query leads quickly to a bunch of articles about Doggerland, an area now beneath the southern North Sea that connected Great Britain to continental Europe during and after the last glacial period. It was flooded by rising sea levels around 6,500–6,200 BCE. Geological surveys have suggested that it stretched from Britain's east coast to the Netherlands, western Germany, and Denmark. Most likely, it was an area with extensive habitation in the Mesolithic period. Rising sea levels gradually reduced it to low-lying islands before its final submergence, possibly following a tsunami caused by the Storegga Slides. This area would have been a region of fairly flat lowlands, maybe with ponds, and certainly with people and wildlife. To this day, fishing trawlers still pull up bits of human artifacts and pieces of wood from the forests that were drowned back then. 2. Different zoom levels will show different layers of information. If you zoom out too far, the label of the nuclear plant won't show up (but you'll see the name of the state). If you zoom in too far, the state name information will be hidden, but you'll see the name of the local watery features (e.g., the name of the nearby bay, "Card Bay"). 3. Validate, validate, validate! As we learned in the Nutrex spirulina pond example, there can be multiple owners (and multiple reasons) for long, narrow ponds. In this case, we had to look carefully at the map, then search for other sources of information about what each of the nearby companies did. 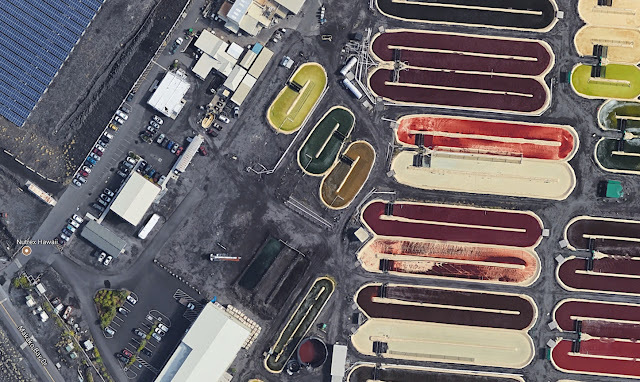 In this example, finding a YouTube video that was a guided tour of the Nutrex facility gave us enough visual information to confirm that what we saw actually were Nutrex bacteria-growing ponds. Tomorrow, I'll talk about the fish images a bit, and pose a new Challenge! Water sometimes hides many details. ... and sometimes it hides a story as well. As you remember from the SRS Challenge of 2 weeks ago: Why are each of these locations very interesting? 1. What's going on with all of these blue lines in the image below? You can find this oddly arranged water/earth combination at Google Maps link. There are several stories to discover here, but first--What is this? 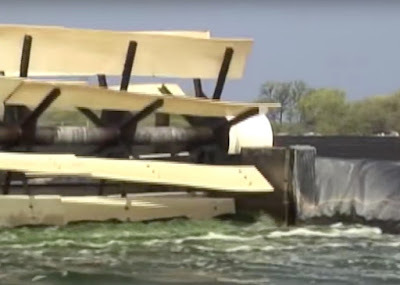 Why the strange water shapes? 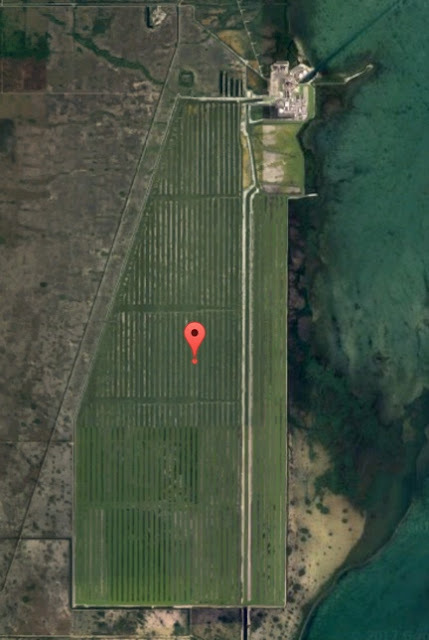 You'll see an obvious structure at the northeast corner of the long stripes of water. If you zoom in a bit on that, you'll get the answer quickly. 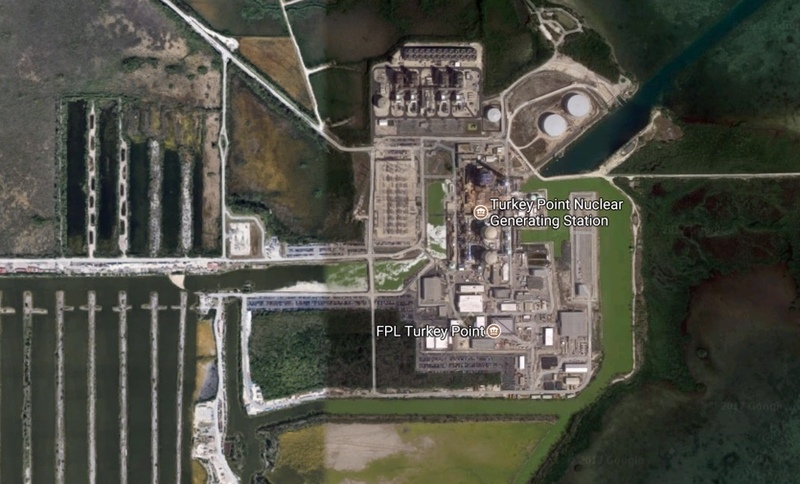 It's the Turkey Point Nuclear Power Plant. Then, when you do the obvious search on Google, you'll see a few likely query completions as you enter your query. PAY ATTENTION to these as you type--they're often great clues as to what you're searching. In this case, we see that they're probably canals. If you go to the Wikipedia article, you'll see that they're "cooling canals," that is, where the hot water goes after it's been through the reactor. This makes sense: they need some way to cool all of that hot water coming out of the heat exchangers. The hot water wends its way through the canals to cool enough so it can be discharged into the ocean nearby. 2. Just below is picture of another oddly shaped and oddly colored bodies of water. Why are these giant oval things such different colors? Maps link. 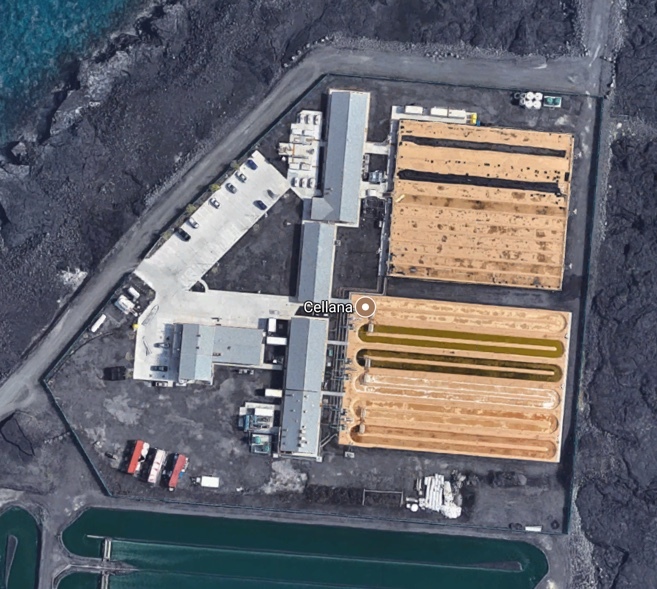 But it's a little hard to tell--are these long, oval ponds part of Nutrex or Cellana? 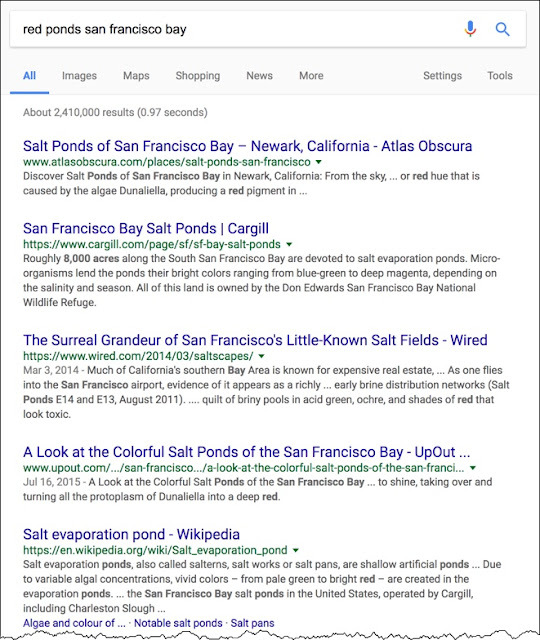 I thought I'd check by searching for information about each company (the both produce algae as food and health supplements)--but most of the web content about both companies is marketing information. That's fine, but how do I tell which ponds belong to which company? Notice that fence that surrounds the Cellana site? (It's that dark line that goes all the way around.) They have a nice 5-sided fence that encloses a bunch of nice light-brown production ponds. 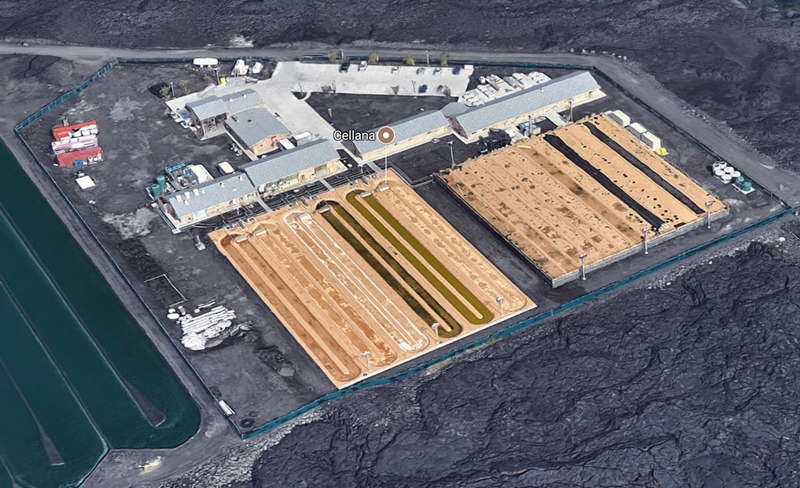 Interestingly, the home page for Cellana has a great photo of their production ponds. If you go to Google Maps and use the 3D controls, you can almost exactly match the point-of-view for this photo. But that's not where the arrow is located: it's a bit farther south. By contrast, if you zoom in on the Nutrex facility, you'll see that the gate is clearly the entrance to this entire (and much larger) facility. Still, is it possible that Nutrex does something else? I wanted a bit more confirmation that Nutrex (the company) actually operated the big oval ponds. And there's also this view of the large, white stirring paddles used at the end of each pond to keep the contents in motion. If you look carefully at the previous image, you'll actually see the large white paddles extending across the ponds. 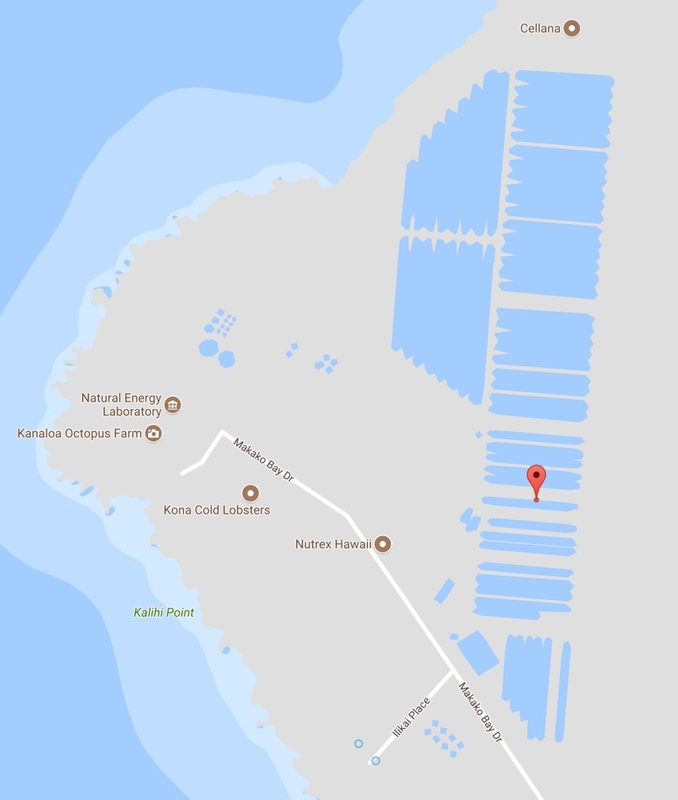 This lines up with the previous image labeled as Nutrex by Google Maps. I'd say these ponds are owned and operated by Nutrex. Why the different colors? It all depends on what's growing in each of the oval ponds. Nutrex has two major products: Spirulina and astaxanthin. Spirulina is a cyanobacteria that's rich green, and since it's their majority product, it takes up most of the space in the ponds (see all that green?). Astaxanthin is a keto-carotenoid that acts as an antioxidant, and comes from microalgae. It's dark red in color, hence the shades of red. 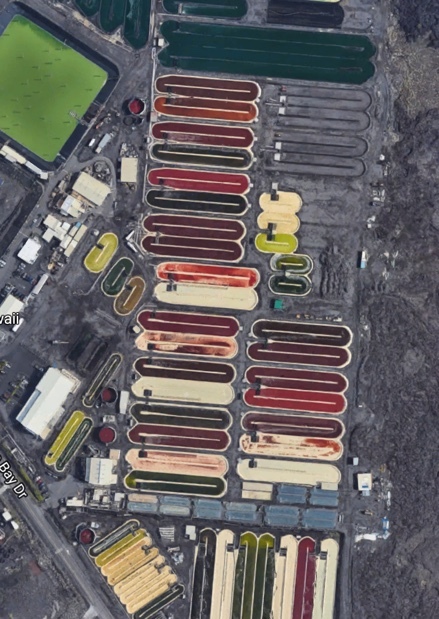 As the company website points out, some of the ponds at Nutrex with astaxanthin are a deep red. 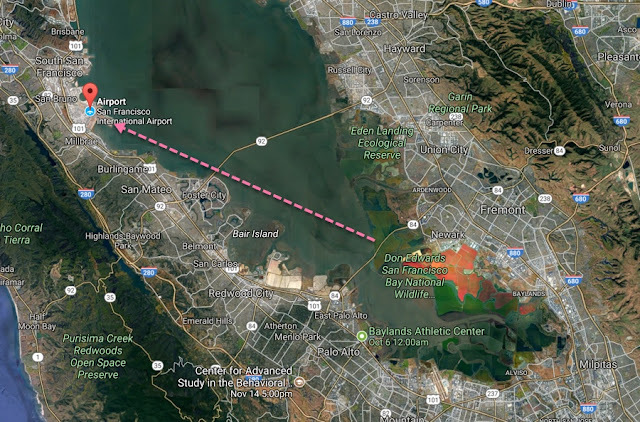 Another Google Maps view of SFO shows a clearly very red/green path in the southeast corner of San Francisco Bay. I added an arrow to show the typical landing approach into SFO. 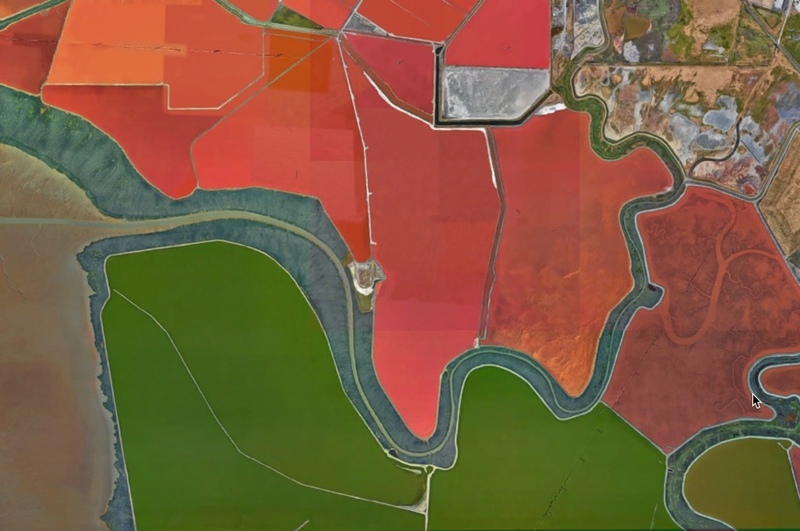 All of these tell us the same thing: The large red and green-colored ponds in the Bay are salt ponds operated by the Cargill Company. The red and green ponds are caused by the organisms or algae living within them, not unlike the Hawaiian ponds. The microorganisms in each pond are determined by their tolerance to salinity, and the colors are reactions to the salinity level. Sea water is let into the ponds, and then they dehydrate over time, leaving sea salt, most of which is then used for chemical purposes (and not human consumption). 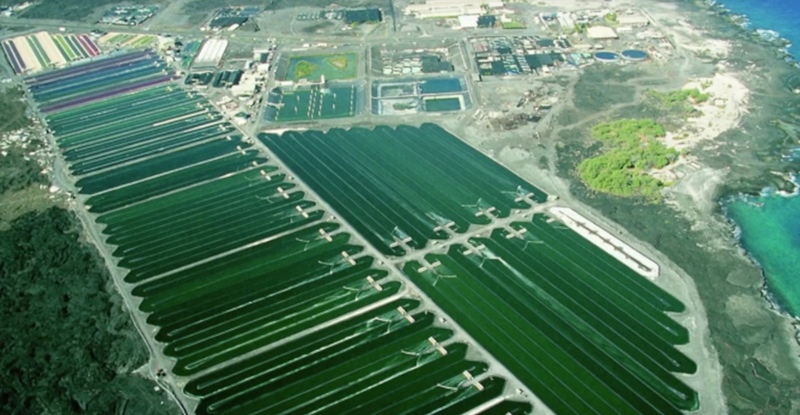 The evaporation ponds vary from bright green (where low salinity encourages green algae, not unlike spirulina), to a deep coral pink or red hue that is caused by the algae Dunaliella at high salinity levels. 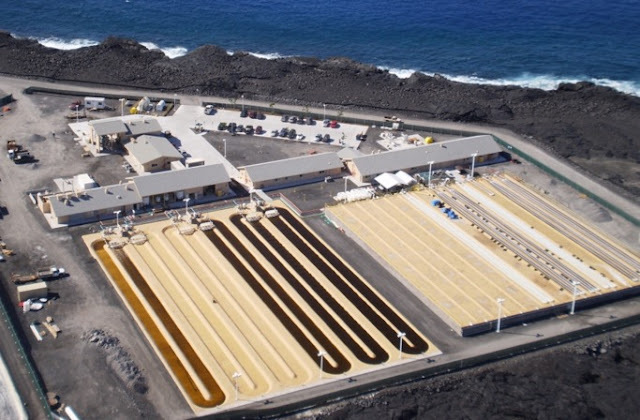 A large number of brine shrimp give an orange color to mid-salinity ponds. 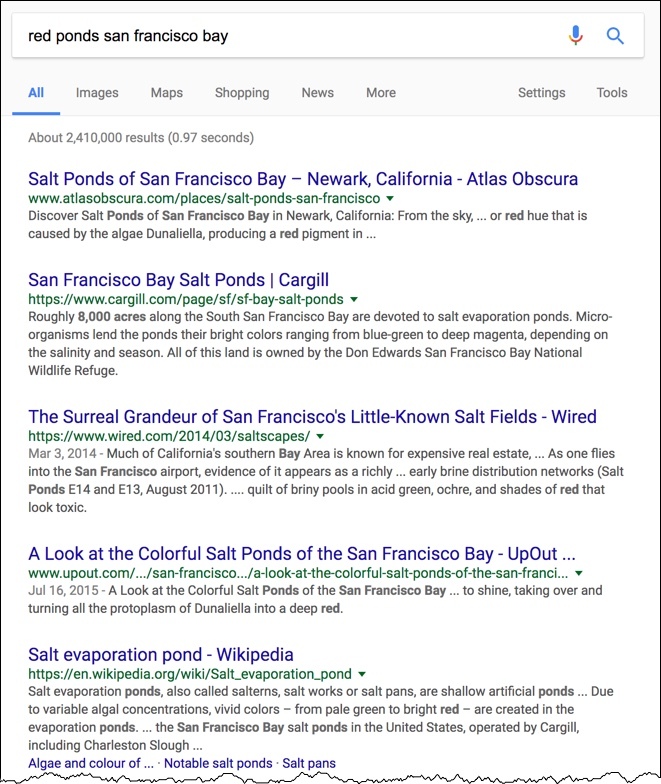 Since 1854, salt has been one of San Francisco Bay's largest industries, with over 80% of its wetlands developed for salt mining. At one point, salt ponds covered over 16,500 acres, most of which was owned by Cargill, Inc.
We're not done with this Challenge: there are two more to go, but I want to get something out before this week ends, so I'm going to post this as Part 1, with a promise to give you the answer (and the Search Lessons) on Monday of next week as Part 2.